It takes like 2 minutes to build a form with the easy drag-and-drop UI. It’s just as easy to go back and update it. It’s easy to add custom logic. For example revealing additional questions depending on how someone answers a previous question. You don’t get spam through Wufoo forms. You can accept money through a form and Wufoo takes no cut of it. Plugins are the icing on the WordPress cake. With a few clicks, new and exciting features become available. Every month, I hope to find a great, surprisingly cool plugin for you and me that provides just the features that we have wanted for the longest time. So, let me surprise you with what I found in the WordPress plugin index this month. Simple Social Media creates the popular follow buttons for your social networks. The icon’s colors can be adjusted, and, via shortcode, they can be placed wherever you want to, even within text widgets. This plugin is almost a must-have for websites that need to earn money. It deactivates the adblocker and shows the ads even to users with active adblockers. SEO Friendly Images adds the alt and title tags required for Google to used images and graphics. This improves the ranking of your images on Google image search. No further settings are needed. The »Email download link” plugin allows you to give away PDF files or e-books to your readers. Before the download, your users need to enter their name and email address, then the plugin will unlock the download. Additionally, an email with a download link to the e-book or the PDF file will be sent to your users. So, you get the same functionality used by large blogs for these purposes. WP Knowledge Base is your base of all knowledge. This plugin allows you to create a kind of reference book of knowledge, tutorials, documentation, and much more. This plugin gives you as an administrator the option to send an email to registered users directly from WordPress. This can be done for one single user, or for a bulk of registered users. Undoubtedly an interesting feature for member websites, or blogs with multiple authors. With this plugin, you can give your team lots of exposure. It can display your team’s members in an appealing way, and, on top of that, it’s responsive. Every team member can be presented with a photo, job title, and the respective social networks. It comes with a shortcode generator for the WordPress editor, so you can comfortably integrate your team anywhere on every article or page. When selling ebooks on Amazon or other providers like Google Play Books or iBooks, this plugin will be the one for you. It creates a widget for the sidebar and displays the book’s title, the cover, and links to the providers. TK Google Fonts lets you use the variety of Google fonts in your theme. You can easily set the fonts in the WordPress theme customizer, and see how they will look on your website. The plugin only loads the fonts that you choose. Thus, it won’t affect the theme’s loading time (much). This plugin takes care of meeting the European data protection guideline on cookies. Since 2011, all commercially used websites have to meet the cookie data protection guidelines and display a message. This plugin is also especially important for users of Google Adsense ads, as Google requires you to use one of these plugins. »Advanced EU Cookie Law Consent” allows you to customize this message so that it fits your website’s design. I feel like this month was unusually generous in terms of good plugins. I like the plugins »Anti-Adblock Adbreach”, »Email download link”, and the »book widget” a lot. I am likely to use »Advanced EU Cookie Law Consent” on my website, as it seems to be better-suited for this purpose than the one I use now. Which of this month’s plugins do you like? A decade ago, it might have cost thousands of dollars to get a beautifully-designed website! But thanks to the proliferation of top website builder companies and website frameworks like Joomla and WordPress, it’s now easy, simple, and fast to get a great-looking website template. But the framework is just one part of the equation to a great-looking website. It’s unfortunate but true that cheap-looking stock images are very common, and can absolutely detract from an otherwise great website design. Even worse than just being tacky and dates, many of these stock images can cost their users cash which could be going to other website improvements. And the effect of high-quality graphics on web design and overall appearance cannot be overstated. In an time where it’s easy for anyone to have a website, the smallest details which can increase your website’s sense of authority and legitimacy can have dramatic returns on subscriptions and conversions. But, believe it or not, there are many websites which offer large, high-resolution, high-quality photos without any copyrights! This means that you can use these photos without crediting or paying! The list of stock photo websites below include images which have all been released under the public domain. Located at StockSnap.io, this website has hundreds of gorgeous stock photos and high resolution photos all released under the creative commons 0 license. This means they’re free and require no attribution! Their large amount of photos and images, coupled with their amazing, easy-to-use search function, makes it simple to browse all the photos they offer. Hundreds of images are added weekly to this website, and you can easily see which ones have the most views or downloads. Unsplash is very similar to StockSnap, and all of their images are released under public domain licenses and published for free. This website has quickly become one of the best go-to sources for stock images, and often their photos are high-definition and broad in scope. Whether you’re looking for cityscapes or portraits, rest assured that you can find it here! Unsplash averages roughly one new photo added a day. Just head to Unsplash.com! The Gratisography website offers photos free for personal or commercial use, and like all of the above, are free of any copyright restrictions. Interestingly, this website is the pet project of Ryan McGuire, the photographer responsible for the uploads and photos. New photos are uploaded roughly every week, and include amazing black-and-whites and great filtered photos. Negative Space provides 20 new photos every week released under Creative Commons CC0. The photos are searchable and can be sorted by category, copy space and color. Negative Space is an apt name for this stock photo resource! Many of the photos do include great examples of negative space, which make them ideal for converting into graphics with words. The image search function allows you to search for images which have negative space on the center, top, sides, or bottom. Perfect for adding some value to your web design! Little Visuals was the pet project of Nic, a longtime photographer, who released all photos on the site to the public domain with no requirement for attribution. But unfortunately, he passed away relatively recently. His family has done a great job of supporting his project in his memory, and continues to run the site on donations. Many of these photos include great everyday scenes in high resolutions. Another large amalgamation of free photos, Picjumbo perhaps has the largest variety. There are abstract images, nature photos, and fashion and tech shots… anything you could want! Free for commercial and personal use, Picjumbo is unfortunately also among the most difficult to search of the free websites we mention. As citizens of the digital world, we are constantly flooded with data. From website analytics to our fitness tracker, data is all around us. As a result, for the front-end designers it is becoming increasingly difficult to present data in a way that stands out from other data sources that are competing for a viewer’s attention. Now, without further ado, let’s get started with the tutorial! In addition to AngularJS, we need a charting component. For this project, I am going to use FusionCharts. It has a good collection of charts and provides a dedicated plugin for AngularJS. See the Pen AngularJS Charts: Creating Stunning Charts for Your AngularJS App by Vikas (@vikaslalwani) on CodePen. Before we get to making chart, we need to gather the data and structure it according to format accepted by the charting library. FusionCharts accepts both JSON and XML. We are going to use JSON as it is the most commonly used format for data exchange in modern web apps. Since every chart has a different use case, we need to structure the JSON according to the particular chart we want to plot. Here’s a little trick I use: I find JSFiddle for the chart I want to make from FusionCharts’ chart fiddle gallery and copy the format. Then I replace it with my values and adjust it if I have more or fewer data points. Core AngularJS library: any minified 1.x version will work. FC’s AngularJS charts plugin: this plugin needs to be downloaded separately. After including the above dependencies, we will create the AngularJS app and inject the ng-fusioncharts module, which is the plugin we are using. The next step is to define the Angular controller for our app. For this, we augment the controller scope with Fusioncharts’ chart definition. $scope.dataSource contains chart configuration parameters and the data being used to plot the chart. I have only included a few parameters in the above code snippet to avoid cluttering. But, there is a lot you can do as I will explain later. width defines width of the chart container. Keep it 100% if you want your chart to occupy full container width and be responsive. height defines height of the chart in pixels. type defines the type of chart being plotted. We are making multi-series spline chart and it has the alias msspline. To find the aliases for other chart types, head over to the chart attributes page and type the name of chart you want to plot. dataFormat defines the format in which we will feed data (XML or JSON). dataSource contains chart configuration options and data array. If you followed above steps properly, then you would end with a chart that works, but is nowhere near “stunning”. So how do we make it look like the chart you saw at the beginning? Enter chart attributes. Chart attributes allow you to control your chart’s aesthetics. There are literally hundreds of attributes you can use give your chart the feel you want. Just go to the above page and type the chart name you want to customize. For our chart, this is the page that contains all the attributes. baseFont: This attribute controls the font family being used on your chart. You can use any font you like. In my example, I have used “Roboto Slab”. Just include the relevant font file in your HTML and you are good to go. bgColor and canvasBgColor: These attributes let you customize background color for the chart container and its canvas. You can set any hex color code as the value of these attributes. anchorRadius: If you notice, there are small circles corresponding to all data points. Those little circles are called anchors. anchorRadius lets you control how big those circles will be. toolTipBgAlpha: This attribute controls the transparency of the tool-tip. You can pass any number from 0 to 100. 0 means completely transparent and 100 means opaque. The meaning of each attribute becomes easier to guess once you get the hang of it. If you can imagine what you need, there’s a good chance that you will find an attribute for it. And that’s it! We have a working chart built with AngularJS. Feel free to post a comment below or ping me on Twitter if you have any questions about my tutorial. Happy to help! LAST DAY: HUMONGOUS Font Bundle (30 Fonts with Extended License) – only $29! Since eight years, we start into the new month with a collection of desktop wallpapers — the best way to fuel some fresh inspiration, as we find. And it’s not any different this time around. Designers and artists from across the globe shared their creations with us for April 2016. The result is a collection of desktop wallpapers with a unique mix of ideas and styles, eye candy that is bound to cater for new idea sparks. We are very thankful to everyone who has contributed to this challenge and who keeps the steady stream of wallpapers flowing by sharing their artworks each month anew. The wallpapers all come in versions with and without a calendar and can be downloaded for free. It’s time to get your desktop ready for spring! The post Desktop Wallpaper Calendars: April 2016 appeared first on Smashing Magazine. Do you get a dozen emails each day pitching this link building service or that social media manager? What about freelance SEOs and content writers offering to provide you free quality content or links? In fact, I just got an email yesterday offering paid links on some of the most high-profile authority sites across a variety of niches. While I recommend bloggers earn their links by building relationships and credibility within their industry, these links would have been excellent additions to anyone’s backlink profile. But what happens when you aren’t being pitched links on easily-recognizable, high-traffic authority websites? After all, hiring an SEO company or freelancer can make or break your business, so it is important you choose someone who isn’t going to get your website penalized and waste your money buying useless low-quality links. Whether you’re learning how to start a blog or managing the link building process for a large corporate website, here’s how to gauge whether a link is valuable or not. Since Google stopped updating PageRank (PR) a couple of years ago, the SEO industry has replaced PR with Domain Authority (DA) as the primary metric to gauge a website’s strength. Unfortunately, Moz’s DA metric has a few flaws. First, Moz isn’t Google or its subsidiary. The company and its developers have no inside knowledge of Google’s algorithm or the hundreds, if not thousands, of ranking signals. Second, the company does not have the resources or server strength to crawl and analyze the entire web. Remember, it takes Google days and weeks to sometimes run the algorithm that processes the Penguin and Panda updates. Then there is the issue of analyzing the SEO and backlink profile of every website, gauging the quality, and assigning a value. This is one of the biggest problems I’ve noticed with Moz. For example, I have a couple of test websites. They are tiny WordPress blogs with no real value to the world. 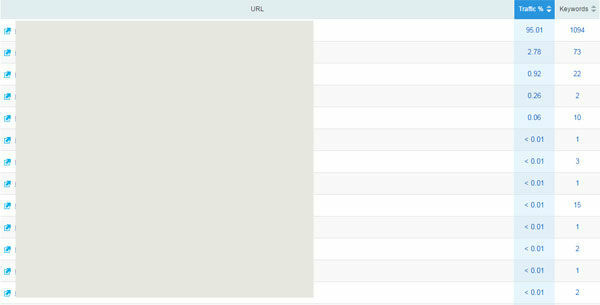 The domains were never registered before so they started with a clean slate, and I’ve checked their backlink profiles on multiple occasions only to find a handful of “nofollow” links. Yet somehow, these domains have achieved a DA of 7 and 9. Finally, can we all agree that when Google algorithmically or manually penalizes a site and the domain loses all of its Google search engine traffic, the website effectively has no SEO value for your Google rankings? Moz’s DA does not have an indicator for this. You could be building links on a DA70 site that have absolutely no effect on your search engine rankings. The bottom line is that the Domain Authority metric is easily manipulated and offers inconsistent indications of link strength. If an SEO company is quoting you links based on DA, you’re likely to overpay for what you get. The best and most direct way to gauge the value of a link from a specific domain is keyword rankings. If search engines respect a website and its content, they will rank their posts. Like any aspect of SEO, this approach is part art and science and requires some use of sound judgment. First, you will need a strong keyword rankings checker. I use SEMrush. Frankly, in my suite of SEO tools, SEMrush is the most powerful and important to me. Start by entering the domain of the link building opportunity you want to analyze. Now click to expand the “Organic Research” tab on the left and choose “Positions”. You will see a bar chart and with a line graph to the right. Opt to view the organic rankings over “All time”. Below is a snapshot of a website’s keyword rankings. Notice the gradual upward trajectory, demonstrating that the site has consistently earned more authority and rankings over time. However, the most important thing to pay attention to is that there haven’t been any significant dips in traffic, meaning no algorithm updates have affected this site. On the flip side, some of the domains you may consider reaching out to will have traffic trends similar to the chart below. If you don’t look at a website’s Google traffic and rankings, you may see a domain with high DA metrics, but in reality, the site is penalized. And needless to say, a site that is penalized isn’t worth your time. Similarly, you may find sites with downward trajectories. Although they may not be penalized, a consistent decrease in rankings is an indication that Google is slowly devaluing the website’s content. You can still reach out as part of your campaign, but I would prioritize it for slow days or weeks when you don’t have high-value properties to approach. Once you do find a domain with decent to strong traffic metrics, it is critical that you evaluate whether this domain authority extends to the entire site or merely a few pages. This analysis will determine how you prioritize this domain and how much effort you are willing to invest in building a relationship and earning a link. For example, some domains have one or two posts that account for a bulk of their traffic. You’ve noticed websites like that, right? Where Google falls in love with a particular page from that site and ranks it for every exact and partial match keyword while the other posts of the blog enjoy tiny traffic and rank for only a few exact match phrases. The chart below provides an example. At the very least, these types of blogs aren’t penalized and have some SEO value. On the other hand, wouldn’t you rather be working with a website that has garnered enough Google Trust that every published post earns high enough rankings to contribute to the site’s overall traffic? Ultimately, beyond just the immediate SEO value of link building on authority publications, you will enjoy increased exposure, new followers, and the potential for future bloggers to link to your blog, resources, and content via referral traffic. An example of a blog with evenly distributed traffic sources can be found below. This data can be found via SEMrush again. When perusing under the “Organic Research” section, click on the new “Pages” options and find a domain’s top performing content. Freelance SEOs and agencies are like most other B2B businesses – unless they are run by ethically-driven leaders with a keen focus on quality and a long-term mindset, they will get away with whatever you allow them to. Start by developing your personal methods of analyzing and evaluating link building opportunities. Once you’ve determined an opportunity is worth pursuing, then decide and negotiate a price. In the long run, building quality links will help ensure piece of mind for your online business. Twitter recently turned ten-year old, and to celebrate its birthday, it made its interface friendlier and easier to use for those with visual impairment. In other words, Twitter has made images on its site more accessible for everyone. As you can see, you can now add descriptions to your images, such that those are visible to people with visual impairment. Interestingly, as opposed to the standard 160 characters for tweets, the descriptions for images can be up to 420 characters. Twitter has also integrated this feature with third-party clients by means of REST API and Twitter Cards. What do you think of this move by Twitter? Share your views in the comments below! Divi 2.7‘s new features that have been incorporated into this release are not simply improvements. They are trend setters. Whereas the vast majority of WordPress themes focus on creating unique and satisfying user experiences, which obviously makes for happy clients. Divi 2.7 takes things a step further. With this release, Divi is more than a website-creating theme, it is a marketing tool as well. Web designers, as a rule, do not fully integrate sales and marketing solutions into their creations, because they lack the tools that enable them to do so. Divi 2.7 changes all of that. It enables the designer to create websites that have brains as well as good looks. Why is CRO the Next Big Thing in WordPress Themes? WordPress themes have long been built with UI and UX in mind, but the vast majority do not go beyond creating websites that can attract and engage users. They do not measure user activity for purposes of enhancing and optimizing conversion rates. With its 2016 2.7 release, Divi has accomplished precisely that. Everything changes with the new conversion rate optimizing (CRO) features that have been included in this latest release. Web design and marketing can how proceed hand in hand; for the benefit of the client. The objective of CRO is to improve your websites performance; in terms of sales, leads, and so forth. Analysis and subsequent action is based on real information; not on guesses or hunches. Optimization is based on key performance indicators (KPIs) that are often unique to a given website. CRO is designed to make the most of your existing traffic. Divi Builder has always been a premium drag and drop landing page builder, but its focus has been more on user experience than on that of the client’s. Divi Leads, a natural extension of the Divi Builder, changes all of this. Divi Leads is a split testing (A/B testing) system. A/B testing allows two versions of a web page to be compared against one another with respect to their respective marketing performances. Validate image placement on a page to see which is most successful in getting the desired user response. A web page variant may be as simple as a headline or the location of a button, or as complex as a complete redesign of the page. The objective is the same however; to see which way works best with respect to CRO. It’s worth repeating that conversion rate optimization is based on genuine insights, real data, and statistics rather than on subjective thoughts, hunches, or opinions. What do powerful stats and insights mean, with respect to Divi 2.7? After A/B testing has started, pertinent information needed to judge which of the variants is the winning variant is gathered. As noted, KPIs can be somewhat website unique, but generally consist of measurements of clicks, sales, and bounce rates. The winning variant will be the one that provides the greater advancement toward a given set of goals. These goals often include determining why website visitors aren’t converting, and fixing the problem once it is discovered what it is or might be. At times this will be an iterative process that works toward achieving a specific goal, and in most cases a number of design variables will be investigated and tested. Divi 2.7 does this. This latest release includes improvements in Divi and the Divi Builder in other ways as well. Divi users will love the new portability options, which make it easy to create, share, and transfer both Divi configurations and Divi Builder layouts. This benefits collaboration among design colleagues and with clients and with clients, since specific configuration settings can be ported. The new Divi Builder page settings feature makes it possible for the designer to adjust or modify design options for an entire page, as opposed to doing so in an element by element, or module by module, piecemeal process. All in all, Divi users and newcomers alike will find these 2.7 enhancements will not only be cool, but represent an important new trend in WordPress themes by enabling the designer to test and measure CRO in a working environment. Elegant Themes currently features a collection of 87 extraordinary WordPress themes that have been put to use by more than 300,000 customers. Elegant Themes focuses on stellar themes, characterized by pixel-perfect detail and aesthetic superiority. The host of shortcodes, theme options, and templates give the designer total control over the website design/build process. No matter which theme or themes you select, you can be assured of whatever support you may need to get your website or blog up and running in no time, whether you are a beginner or a seasoned pro. The support is top-notch.